1656 ~ 1694: born in Kyôto. He started his career as a shamisen player performing under the name of Fujikawa Izaburô. Beginning of the 1680s : he was scouted by the star Yamashita Hanzaemon I, who welcomed him as a disciple and trained him as an actor. His first stage name was Ônishi Moriemon. 1st lunar month of 1688: he took the name of Kataoka Nizaemon I in Kyôto. 1st lunar month of 1695: Nizaemon played in the drama "Shuten Dôji", which was produced in Kyôto by Kokon Shinzaemon. 11th lunar month of 1695: Nizaemon played as a katakiyaku in the drama "Hime Kura Daikoku Bashira", which was produced by Sakata Tôjûrô I in Kyôto at Miyako Mandayû's theater. 1696: Nizaemon settled in Ôsaka and became zagashira of a troupe which played in Iwai Hanshirô I's productions. 1st lunar month of 1698: his rank in the Ôsaka hyôbanki, katakiyaku section, was jô-jô-kichi (superior - superior - excellent). 11th lunar month of 1698: Nizaemon became zamoto and produced with success the plays "Ishikawa Goemon", "Yadonashi Danshichi" and "Shuten Dôji" in Ôsaka at Shioya Kurôemon's theater. 1st lunar month of 1699: Nizaemon coproduced several played with Araki Yojibê I. Spring 1700: Nizaemon became tachiyaku and triumphed in Ôsaka in the play "Keisei Mugen no Kane", written by Ki-no-Kaion (Chikamatsu Monzaemon's rival playwright) and produced by the zamoto Otowa Jirosaburô I. Winter 1700~1701: Nizaemon became zamoto at Shioya Kurôemon's theater. 1st lunar month of 1701: his rank in the Ôsaka hyôbanki, tachiyaku section, was jô-jô (superior - superior). He produced the play "Hyakunichi Soga" in which he played the role of Soga Gorô. 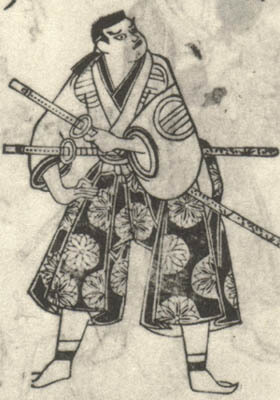 His stage partner for the role of Shôshô, Gorô's courtesan lover, was the onnagata Sodesaki Karyû. 11th lunar month of 1701: Nizaemon produced in Ôsaka the kaomise drama "Yadonashi Danshichi Shichinenki", in which he played the eponymous role of Danshichi; his stage partners were Takioka Hikoemon (Issun Tokubê) and Osagawa Jûemon (Tsuribune Sabu). 1st lunar month of 1702: his rank in the Ôsaka hyôbanki, jitsuaku section, was jô-jô-kichi (superior - superior - excellent). Nizaemon produced at Shioya Kurôemon's theater the drama "Heishin'ô Masakado" in which he played the role of Masakado; his stage partner in the role of Ishiômaru was Sawamura Chôjûrô I. 1st lunar month of 1704 ~ 1708: Nizaemon worked as a zamoto in Ôsaka. 8th lunar month of 1706: short stay in Kyôto; Nizaemon performed with Segawa Takenojô I in the plays "Ishikawa Goemon" and "Ôtomo no Matori". 11th lunar month of 1706: Nizaemon produced in Ôsaka the kaomise drama "Ebisu Otoko Onna Daigoku Hashira Gatame"; his stage partners were Shibazaki Rinzaemon I, Arashi Sanjûrô I, Asao Jûjirô and Yoshizawa Ayame I. 11th lunar month of 1707: Nizaemon produced in Ôsaka the kaomise drama "Manpô Chibako no Tama", in which he played the role of Aridôshi Amiemon. 1st lunar month of 1708: Nizaemon produced in Ôsaka the new year drama "Minamoto no Manjû Okina Muko", in which he played the role of Hirai Yasusuke. 11th lunar month of 1709: Nizaemon returned to Kyôto and played in the kaomise drama "Yomeiri Ôkeizu", which was staged at Ebisuya Kichirôbê's theater. 1st lunar month of 1710: his rank in the Kyôto hyôbanki, tachiyaku section, was jô-jô-kichi (superior - superior - excellent). 11th lunar month of 1710: his son Kataoka Sanpei became zamoto and produced at Kameya Kumenojô's theater the kaomise drama "Kenkon Daikoku Bashira". The success of the performance was overwhelming. 7th lunar month of 1715: Nizaemon played in Kyôto in Sakakiyama Kansuke's dramas "Aigo no Waka Ômi Hakkei" and "Jûsan Gane", which were produced by Sakakiyama Shirotarô I. Fall 1715: Nizaemon appeared on stage for the last time, at Kameya Kumenojô's theater, playing the role of Iwagi no Hangan in the play "Sanshô Dayû". 11th lunar month of 1715: Nizaemon was about to perform in Kyôto in the kaomise drama "Manpô Chitose no Matsu" but he fell ill and died suddenly the 1st day of the 11th lunar month of 1715 . He was replaced and a moving oration dedicated to his memory was made on stage by the actor Shinozuka Jirozaemon I.
Kataoka Nizaemon was a prominent Kamigata tachiyaku, who won fame for himself during the Genroku era. He was extremely appreciated by the Ôsaka and Kyôto audiences in the roles of katakiyaku and jitsugotoshi. He was the first actor to play and popularize the role of Danshichi Kurobê, now one of the most famous male roles in the Kabuki repertoire. The 1st day of the 11th lunar month of the 5th year of the Shôtoku era was the 26th of November 1715 in the western calendar.